Rice vermicelli is a quick Indo-Chinese fusion recipe. The base ingredient is the rice vermicelli from the Thai cuisine, tossed in sauces from Chinese cuisine. On top of it, a "desi tadka" (Indian tempering) creating a medley of flavors. It makes a light and tasty breakfast dish. Heat water in a sauce pan, when boiling add rice vermicelli, 1/2 tsp oil and salt. Stir and let it cook for 4-5 mins or until it gets soft. Drain water using a big sieve or colander. Drizzle few drops of oil on cooked vermicelli and grease it well with hands. Heat a wok/ karahi and add 1 tbsp of oil. When hot add mustard seeds and curry leaves. Let them crackle. Add onions and stir fry for 1 minute. Now add cabbage, carrots and capsicum. Stir fry on high until vegetables start turning golden. 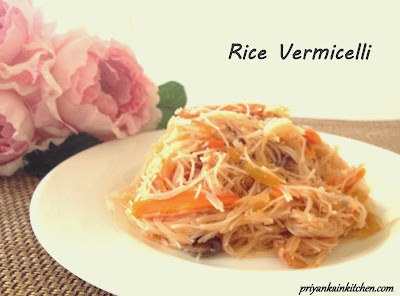 Reduce the heat, add vermicelli, sauces and salt. Mix well. Tip: Stir frying on high is required to maintain the crispiness of the vegetables. If you want the vegetables to be fully cooked and soft, then add salt to vegetables and cook covered on low heat.